Not many of us realized that there existed a great pork-free restaurant within the premises of Sunway Carnival Mall, Seberang Jaya, Penang. The restaurant which carries the name “Kim Tavern” may look just like any of the fast food chains or franchised restaurants but it is not as it is the brainchild of proprietor, Mr. Andy Liew. Thanks to Taufulou aka Bok, who came all the way from KL and with the liaison of CK Lam, a few of us had the privilege to visit the place on the invite of the boss. Thanks to Mr. Liew too. Barely a few weeks old since its opening on 16 October 2009, Kim Tavern had already attracted many loyal patrons, even during the low period of the day. Do check out below the reasons behind the success of this newly established restaurant. The main attraction would be the many choices of affordable delicacies available here, ranging from Southeast Asian Favorites to Western Paradise. Let’s start with the local food scene. 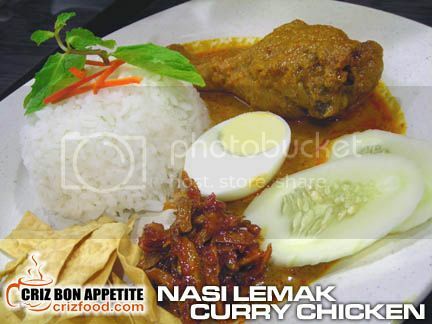 We started with the Nasi Lemak Curry Chicken (招牌椰漿咖哩雞飯-RM7.90). This dish has been remarkably served with fragrant coconut milk enhanced and tender curry chicken drumstick, accompanied with side dishes such as a halved hard-boiled egg, papadam, deep fried anchovies & peanuts in chili paste, cucumber and a bowl of hot steaming white rice. You may ask why the rice was plain rather than the usual fragrant coconut milk steamed rice, right? That’s the healthy way the restaurant believed in. Moreover, it’s also the best way to serve the dish since the curry chicken has already been cooked with coconut milk. I also loved the deep fried anchovies & peanuts in chili paste a lot as the side dish had the required fragrant, crunchiness, sweetness and sourness to get anyone craving for more. 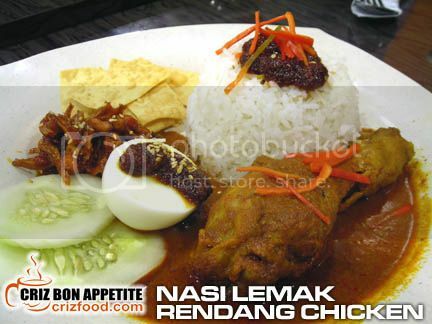 If you love the Nasi Lemak Curry Chicken, you would also love the Nasi Lemak Rendang Chicken (招牌仁當雞飯-RM7.90). Everything would be the same as the above except the style of cooking for the chicken was a bit different. The gravy has a more pungent taste with a hint of lemongrass. The sweet and sour sambal (chili paste) on the egg and rice had a strong but lovely taste of assam (tamarind). That made the whole combination real appetizing. 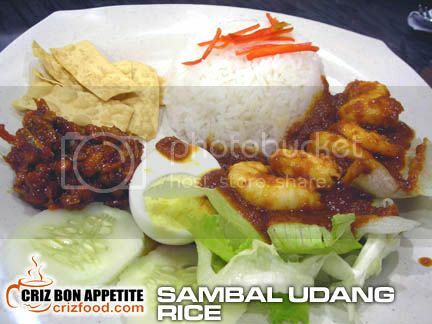 The Udang Sambal Rice (招牌酸辣參拜蝦仁飯-RM7.90) would be another good meal to order. Freshly peeled prawns cooked in fragrantly stir fried sweet and sour assam chili paste and served with the same combination of rice as above surely caught the attention of our fellow female floggers. I’m sure most ladies would love this dish. 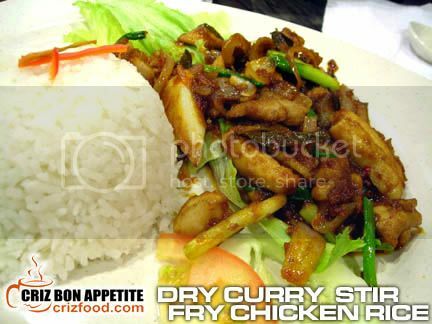 Another of the recommended dish would be the Dry Curry Stir Fried Chicken Rice (祖傳甘香雞飯-RM6.90) or commonly known as the Kam Heong Fried Chicken. This was very appetizing as thin slices of chicken fillets were stir fried with the chef’s secret recipe. There were hints of onion slices, spring onions, chili paste with lots of curry leaves. The wok hei (high heat frying) of the dish was great to go with the steamed rice. If you think that those lovely dishes up there might not be enough, do try out their bento sets. 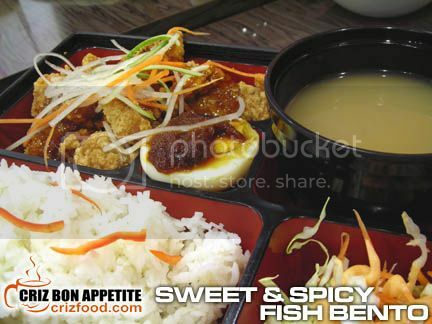 One of the bento sets that made all of us “ooo”ing and “aah”ing away was the Sweet & Spicy Fish Bento (辣味蜜汁魚片便當-RM8.50). The fresh and high graded batter fried dory fillet prepared nicely in sweet and sour sauce, accompanied with some shredded cabbages and carrots topped with thousand island sauce, a bowl of miso soup, a halved hard-boiled egg topped with some sweet and sour chili paste and steamed rice was something delicious and within the budget of everyone. The only feedback from us was the lack of some tofu cubes in the miso soup and the usage of Japanese rice grain. Well, at that pricing and great taste, who’s to complain? You should try this out! 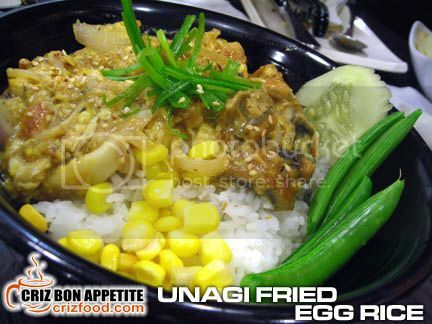 For those unagi lovers, you should try the next dish out which was the Unagi Fried Egg Rice (日式鰻魚炒蛋飯-RM12.90). The dish may look simple with some gravy like ingredients on a hot bowl of white rice, garnished with some boiled corn kernels and vegetables. 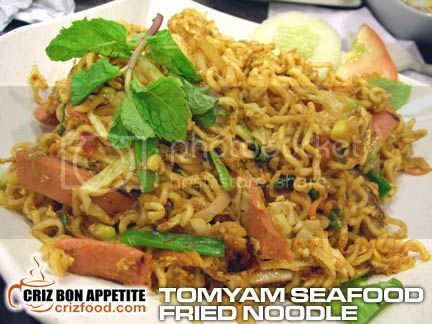 One scoop of this dish and you would be like in heaven. Each mouthful would be filled with the creaminess from the egg, followed by the fragrant taste of sliced onions, firm slices of grilled unagi (eel), wonderfully matched with the sweetness from the Japanese sweet soy sauce. I loved this dish a lot! 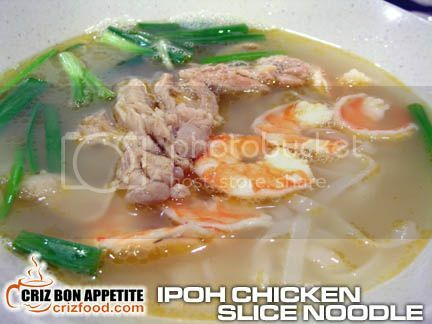 The next dish was the Ipoh Chicken Slice Noodle (祖傳怡保雞絲河粉-RM6.90) or commonly known in Ipoh as the Kai See Hor Fun. This bowl of noodle lacked the originality in soup broth compared to those found in Ipoh. Although the soup base was thick, it lacked the taste from the long hours of simmering of some fresh prawn shells. Overall, this dish was still delicious as only specialized stall such as those found abundantly in Ipoh would be able to come out with such a unique taste. The dish had reasonable serving of chicken slices, prawns and cut spring onions. 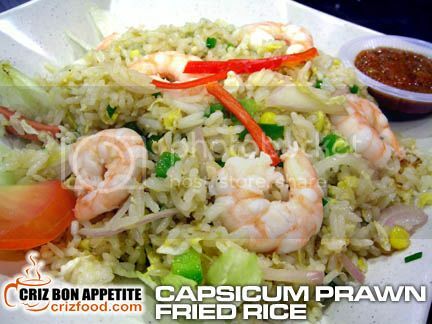 Capsicum Prawn Fried Rice (招牌燈籠椒蝦仁炒飯-RM7.90) was served next. This dish looked just like the usual Yang Chow Fried Rice but if you inspect closely at the green colored cubes, you would realized that it had many finely chopped capsicum added in. It was wonderful. Not only was the wonderful skill of the chef in creating the “wok hei” present, the mild peppery taste of the “bell pepper” added the additional fragrance which made this simple plate of fried rice delicious. This dish was served with the chef’s specially prepared sambal belacan (shrimp paste chili). 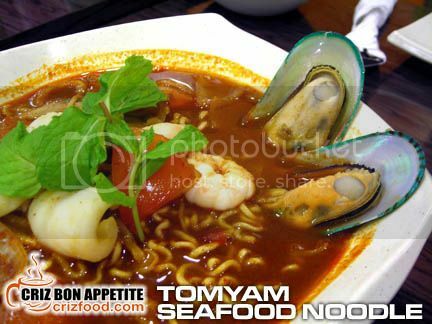 You could also try out their Tomyam Seafood Fried Noodle (冬炎海鮮炒金旦麵-RM8.50). This was the fried version of the earlier tomyam dish with some additional chicken sausages. Although fragrantly fried, most of us preferred the soup version. As for me, I personally felt that simplicity would be better minus the sausages. If you think that all the dishes mentioned above would be too “heaty” for your body system, there’s always the porridge section. 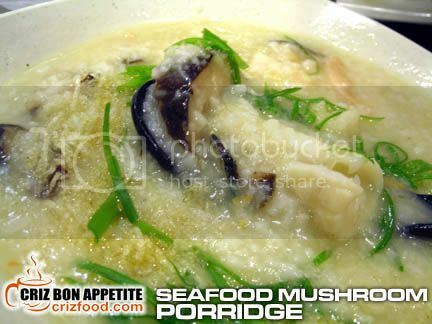 We did try out their Seafood Mushroom Porridge (香菇魷魚海鮮粥-RM7.90). At this pricing and with so much of seafood which included cuttlefish, top graded dory fish fillet, prawns, chunky mushroom slices and so on, this richly ingredient filled porridge would be a great bargain for those porridge lovers. There’s also the Western section for you to select your urge for more delicious dishes. The wonderful thing about dining here would be that the most expensive dishes would cost you barely RM15.90 and those are the Black Pepper or Mushroom Steak. Since we were rather filled up to this stage, we managed to try out their Spaghetti Chicken Bolognese (RM6.90). 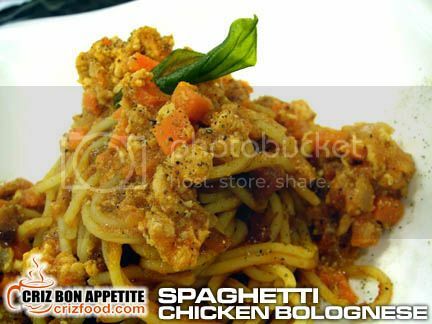 The texture of the spaghetti was just right for our bites and the freshly made Bolognese sauce with minced chicken meat was just perfect. 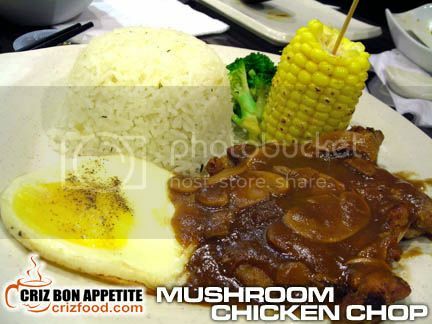 Next on the serving was the Mushroom Chicken Chop with Garlic Butter Rice (RM9.90). The gravy was delicious. It had the right combination of sauces and spices and it blended real well with the garlic butter rice. The only hiccup was on the grilling of the boneless chicken drumstick. It lost the juiciness within. The chef should have taken note on the time needed to grill such a thinly pounded fillet. When the next dish was presented, I suddenly turned orange with black stripes, eyes widely opened and whiskers shot right out of my cheeks. OMG! I turned into Garfield as Cheesy Chicken Lasagna (RM9.90) has always been my favorite and it had such a large portion. The bowl should have at least 5 layers of medium soft lasagna pasta, stuffed with precooked minced chicken simmered in rich tomato puree and generously topped with lots of mozzarella cheese. Yummy! I won’t mind making some takeaways during my next trip. The restaurant also has light meals which included soup, sandwiches and finger food. 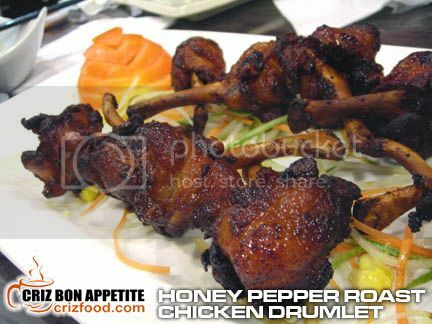 What caught our attention was the Honey Pepper Roast Chicken Drumlet (5pcs – RM6.90). The well marinated drumlets were perfectly roasted. I just wished someone would prepare such nice and tasty ones during BBQ sessions. This would be a must to order. Overall, the food here would be great for families and individuals of all ages. The food served here are rather tasty and reasonably priced. The only setback would be the lack of creative desserts rather than the normal scoops of ice creams but it would not necessary mean that it lacked the necessary beverages to attract the crowd. Some of the smoothies and ice blended drinks we had ordered were amazingly unique and tasty. Amongst those ordered were Fresh Carrot-Orange Juice (RM3.50), Honey Lemon Ice (RM3.80), Mango Smoothies (RM5.50), Wheatgrass Smoothies (RM5.50), Special Ice Blended Peppermint Mocha (RM7.80), Special Ice Blended Blueberry Chocolate (RM7.80), Special Ice Blended Hazelnut Latte (RM7.80), Special Ice Blended Almond Latte (RM7.80) and Special Ice Blended Tiramisu (RM7.80). The top three of our choices were Mango Smoothies, Wheatgrass Smoothies and Special Ice Blended Blueberry Chocolate. The abovementioned dishes and beverages were part of what we had ordered. You can always click and enlarge the menu below to check out more of what they have. 5% service charge would be applicable for all orders. 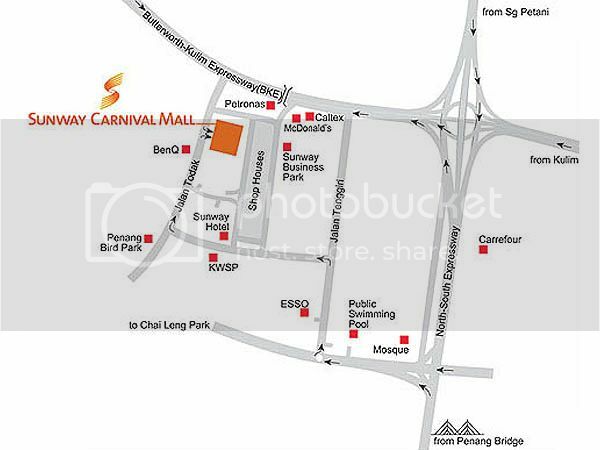 For those who had not been to Sunway Carnival Mall where Kim Tavern is located before, please refer to the attached map. There are two ways you can reach the mall upon coming out from Penang Bridge. Just drive towards the sign leading to Alor Setar. Upon reaching the first flyover, look out for a mosque on your left (Jalan Siakap), drive on until you have reached a mini roundabout and turn 3 o’clock on your right into Jalan Tenggiri. Drive on until you see a traffic light and turn left into Lebuh Tenggiri 2. Drive all the way passed KWSP building (on your left) and Sunway Hotel (on your right) until you had reached a T junction. Turn left into Jalan Todak and you would see the mall on your right. Another way would be driving all the way over the first flyover upon coming out from the Penang Bridge but turn left before the second flyover which would lead you to the Butterworth-Kulim Expressway (Lebuhraya Butterworth-Kulim). Turn left into the expressway and drive all the way until you had reached the third left junction (Jalan Todak). Turn left into Jalan Todak and you would spot the mall on your left. If you are still not sure how to find the place, you can always key in the GPS coordinates stated below in the Google Map and it would show you the mall location. Happy food hunting! Address: LG 04, Sunway Carnival Mall, Jalan Todak, 13700 Seberang Jaya, Penang. Nice review! 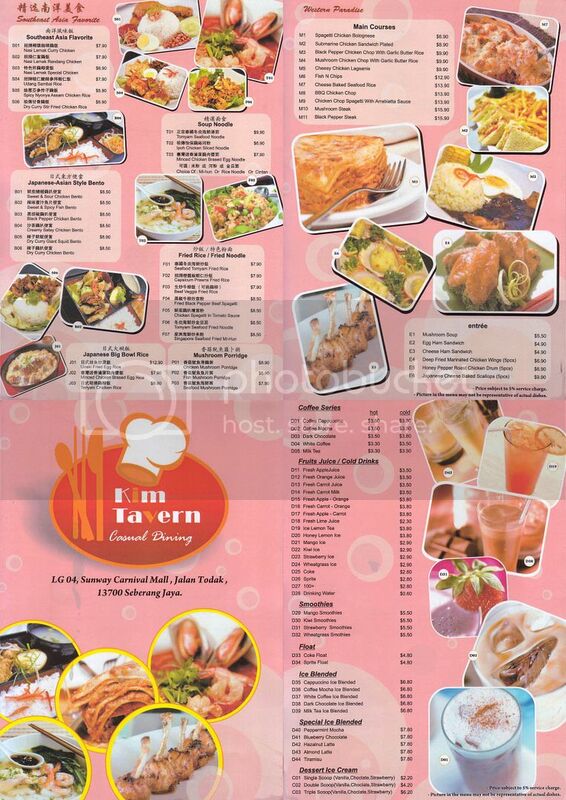 Kim Tavern sure has lots of variety of food in their menu. Hope to see their outlet in the island in the near future. wow … looking at the pictures, i know what i want to order already, the next time i’m there!!! EXCELLENT review!!! Detail and comprehensive too! Nice review, will try them soon..
Wahh… if u say til so nice..i’m very sure it is very nice!! If only i can make a trip back soon..hmhm..
See! You had missed a lot of good food in Penang. When will I be seeing you again, Reb? ?